The 28 land-based reptiles of the Testudo hermanni and Testudo graeca species are in good clinical condition. After the tortoises were received, they underwent veterinary examinations, they were marked and accommodated at the Rescue Center's hospital, where they will stay at least until spring, when they wake up from their slumber. 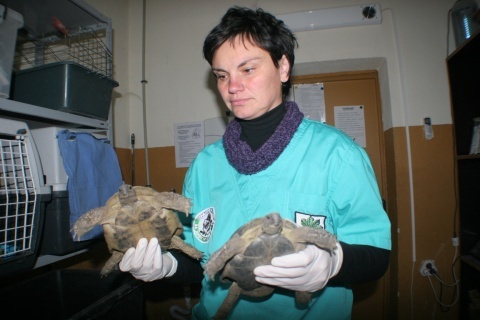 Environmental workers from the Green Balkans Conservation Center are hoping that the case against the Roma clan boss will be over by then, so that the tortoises, which count as evidence in the case, can be set free in an appropriate environment. Tortoises are protected under Bulgaria's Biodiversity Conservation Act and the Penal Code. Both species are globally threatened and listed in Red List of International Union for Nature Conservation (IUCN-2004). On November 9, Bulgarian police officers and archaeologists started inspecting Rashkov's properties in Katunitsa using metal detectors, as it was believed that his clan had buried vast amounts of gold there. However, the authorities discovered tortoises instead. Kiril Rashkov, aka Tsar Kiro, and his clan triggered massive tensions across Bulgaria in September after the murder of a teenager in Katunitsa. On September 23, a van driven by associates of Rashkov ran down and killed 19-year-old ethnic Bulgarian Angel Petrov. Since the turmoil in September, which caused waves of protests across Bulgaria, residents of the southern Bulgarian village have insisted that the Roma family be forced to move out. They have repeatedly stated that Rashkov and his family have been terrorizing Katunitsa for years now.